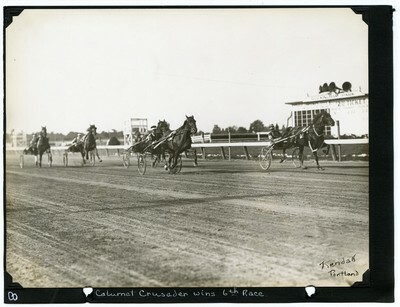 Black and white action photo of the field approaching the finish line in the 2.11 Class Trot at the Grand Circuit Meet, Rockingham Park, Salem, N.H., Wednesday, August 2, 1933. Finishing first in the contest, wearing saddle number 1, is Calumet Crusader, W. Dickerson up, in a time of 2.03. Kashmary, wearing saddle number 3, B. White up, finished in second. Calumet Bush, wearing saddle number 4, H. Stokes up, finished in third. Other horses in the field included Hollyrood Roman, M. Childs up, finishing fourth; Maxhall, W. Leese up, in fifth; and Full Trust, F. Egan up, in sixth. The image is signed in the lower right corner by photographer Guy Kendall.